Proper kids backpacks are a rarity in this day and age. Surrounded by a vast array of plastic Disney emblazoned options, most kit is cheaply made rubbish which could never endure a long haul trip. 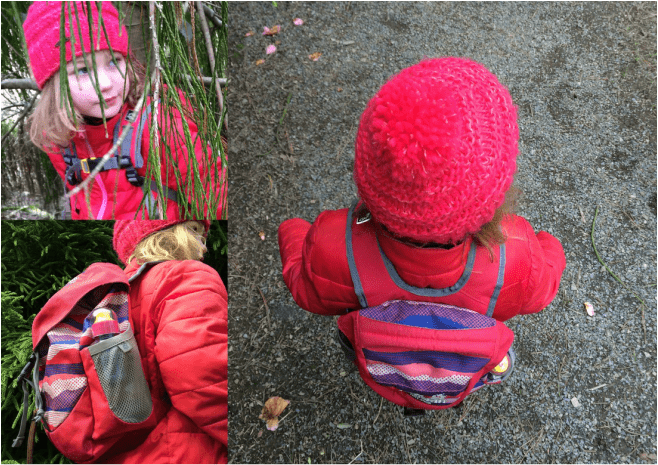 I wanted my girls, who at 3 and 6 were old enough to carry a small backpack on our 9 week trip, to contribute to lugging around our necessities and to get savvy with the cold reality of what every traveller experiences – limited capacity and what to pack. Which toys to take was their decision. They knew the size of their luggage & that they had to carry it – an important lesson for a prospective world traveller. Size relative, comfort and robustness were my priorities. I was also looking for side mesh pocket to fit a water bottle and a zipped top compartment. Exasperated, my internet search threw up only a handful of half hearted options, then I found Jack Wolfskin – a brand which really thinks through its kids designs. Jack Wolfskin boast a whole range of packs spanning tot to teenager. I’m impressed. Tiny Jack, the teeniest, to the serious Alpine Trail, which comes complete with trekking pole lashings and equipped for a hydration system! At only 28cm X 24cm, X 10cm with a capacity of a weeny 9 litres, Tiny Jack was the perfect size for 3 year old Bo. All the clips & fasteners are child friendly for diddy fingers enabling her to access her stuff without asking for help (a massive plus). The extra wide straps are a great feature & certainly make the pack much more comfortable on the go. Critically it has a chest strap, something most child backpacks lack nowadays. The pack boasts of a “SNUGGLE UP suspension system and particularly effective weight distribution” which as far as I can see certainly did the job. In over 70 days on the move, my little one did not utter a single complaint that the straps dug in or hurt her. The pack also features a top mounted, padded carry handle, which makes it easy for you to grab – useful for directing said child in large crowded areas or for you to pick up the pack when inevitable exhaustion kicks in (the shoulder straps are too small to thow over one adult shoulder). There’s only one main compartment, far from stingy Bo can get a considerable amount of stuff in. Made from 100% polyester it’s easy to clean out sticky spills & dries quickly. Light at 290g it is my mind a clear winner. Two stretch mesh side pockets allow a water bottle & easy access for snacks, tissues, sun cream or essential hands on items. The one feature that would have been useful, that are built into the rest of JW’s kid packs, is a zipped pocket on the closure flap. Maybe this was a concerted effort from JW not to over complicate a pack for such a young age. We bought the next size up for 6 year old Minnie, the Explorer. At almost twice the capacity at 16 litres you can pack a lot more kit in this one. It’s has all the basics Tiny Jack has, such as friendly fasteners/padded straps & the like but also comes with some nifty features such as a central ventilation channel on the back padding & reflective elements on the front & back. The pack comes with a removable sit mat which is a nice idea but quite frankly long lost now. The main compartment is roomy. There’s the zipped lid compartment that I was looking for (essential) and a velcroed front pocket which is great for easy access to books, cards etc. Two mesh side pouches again for drinks etc. A nice touch is the name tag and key carabiner. Measures 45 x 26 x 24 cm and weighs 540g. Jack Wolfskin – I’m a big fan. Still going strong after 18 months, these packs are built to last and worth every penny. Live in a tourist hot spot? Fancy a free holiday? Airbnb your gaff and get going!